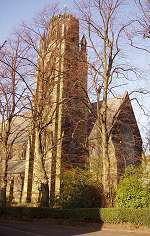 St Paul's Church, adjacent to the memorial, is a late Victorian 'Low Anglican' edifice, designed by the firm of Bird and Whittenbury, built in 1876, and extended in 1896. The octagonal tower, designed by E.P. Oakley was added in 1900. 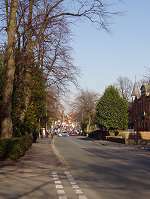 The view along Heaton Moor Road from the memorial. 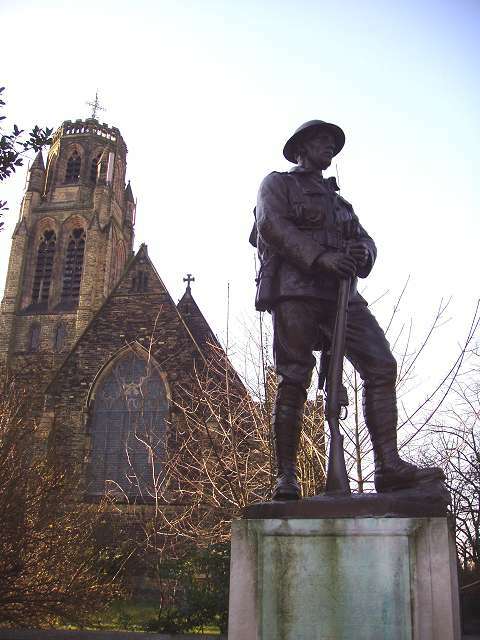 Our knowledge of Stockport's part in World War I is greatly enhanced by a 'virtual memorial' website called 'More than a Name', the product of a vast amount of research by John Hartley, which aims to uncover the life story and war record of everyone whose name appears on an official memorial in the Borough of Stockport. 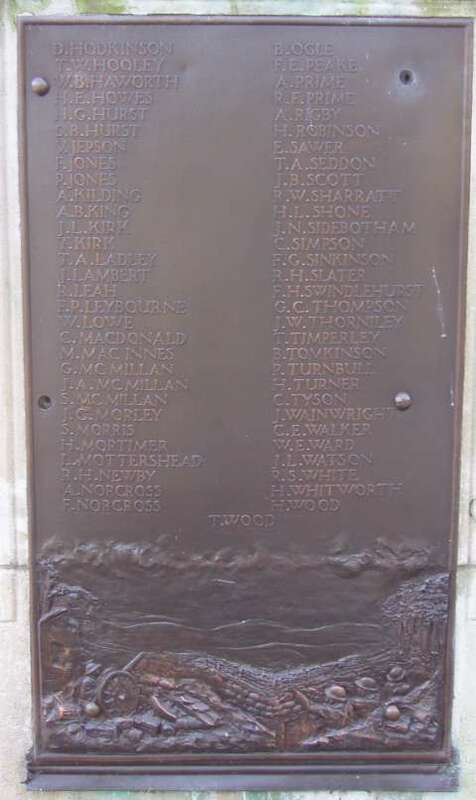 Thanks to this marvellous site, we can bring you not just a list of the names on the Heaton Moor memorial, but in the case of the 1914-19 names, links to the stories of the people commemorated. Many of these are quite fascinating: the first named, Gerald Adam, for example, died in action in the north of Russia in August 1919, well after the official end of the War. Two of the dead were natives of Germany, who had volunteered for the British Army in 1914. Germans formed a significant minority in the Manchester area at the time. In other cases, it has become clear that the name on the memorial is mis-spelled, and there are several names on the memorial about whom Mr Hartley's extensive research has failed to find any information at all. This appears to be a common problem for War Memorial researchers. 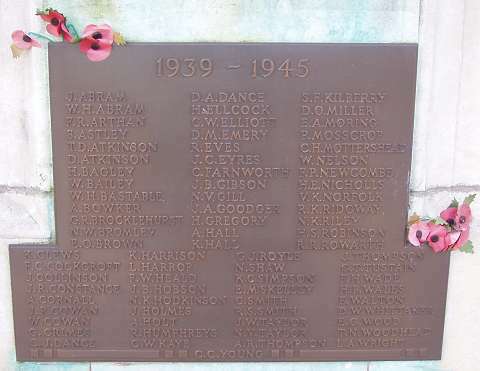 Many, but not all, of the names also appear on Stockport's main memorial in the War Memorial Art Gallery, and some also have a third mention on a memorial elsewhere in Stockport. Follow the links below to the stories on the 'More than a Name' site. Public Sculpture of Greater Manchester, by Terry Wyke. Page 341. UK National Inventory of War Memorials. Heaton Moor is a residential suburb, developed in what was once open country - a 'moor' in this area refers to land exploited for peat extraction - following the opening of a station at nearby Heaton Chapel by the Manchester and Birmingham Railway in 1852. It is distinguished by many large houses and public buildings from the Victorian period, although today many of them have been subdivided into flats, as the wealthier members of society now generally prefer more rural surroundings. Being on the north side of the river Mersey, it was in the county of Lancashire until it was absorbed into the County Borough of Stockport just before World War I, placing it in Cheshire. From 1974 it has been part of the Borough of Stockport in Greater Manchester. 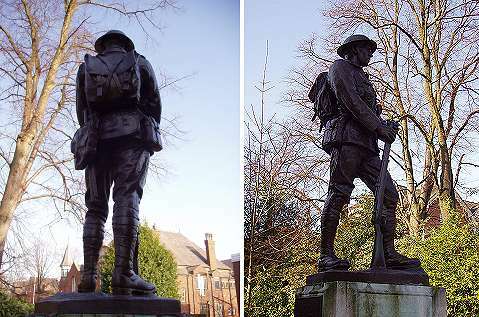 Following the carnage of World War I, it was proposed to commemorate those serviceman from both Heaton Moor and Heaton Chapel killed in the First World War. After some discussion, in the local press and elsewhere, on whether to erect a statue or provide a more utilitarian memorial in the form of a gymnasium, a public meeting decided in favour of the statue. 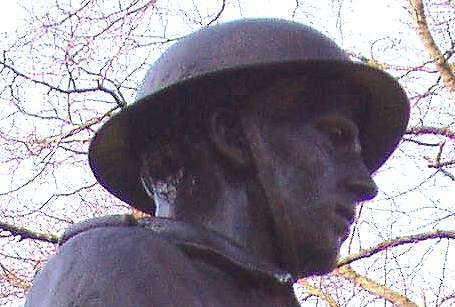 John Cassidy, whose studio was just a few miles away, was approached for a design and proposed a bronze memorial of a soldier and an angel on a stone pedestal, at an estimated cost was £1,800 - £2,000, and agreed not to use the same model for any other memorial within a thirty-mile radius. The original proposal of a soldier and an angel, theme of several Cassidy memorials, notably that at Clayton-le-Moors, was not finally realised at Heaton Moor (perhaps due to financial considerations) and the final work features the soldier alone on a Portland stone pedestal. In this writer's opinion, a more effective and timeless composition. 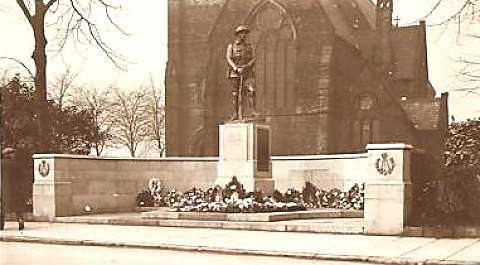 The sepia view above, from an old postcard, shows the memorial in its original form, sometime before World War II, before the front of the plinth was altered to include names from World War II and, much later, the spaces each side were filled with Stockport council's standardised black and cast iron flower-boxes. In fact Cassidy did use a very similar design at Colwyn Bay in Wales, safely outside the 30-mile limit. 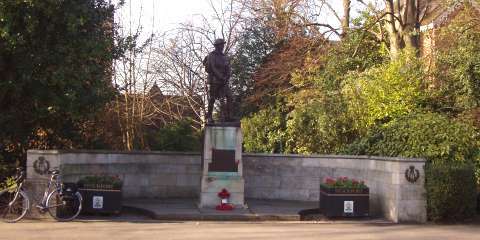 The memorial in 2008. The wall was repaired in 2000 after being struck by a road vehicle. Two views of Cassidy's soldier. The faces of the plinth carry lists of the people of Heaton Chapel and Heaton Moor who died for their country in the two World Wars. The first of the two World War I plaques has been lost, stolen, or otherwise, removed, and replaced with a replica in rather modern style. 'D. Furguson' is obviously a mis-spelling of the usual name 'Ferguson' as can be seen from its position in the alphabetical order. Whether this error existed in the original we cannot say. The second half of the list is Cassidy's original: two of the fixing pins of this one are missing. 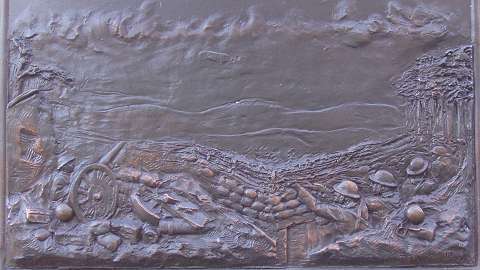 Like Cassidy's other monuments in this style, a relief scene is included, this one giving a graphic illustration of trench warfare. The lost plaque would have had a different, but related, scene. A closer view of the relief. 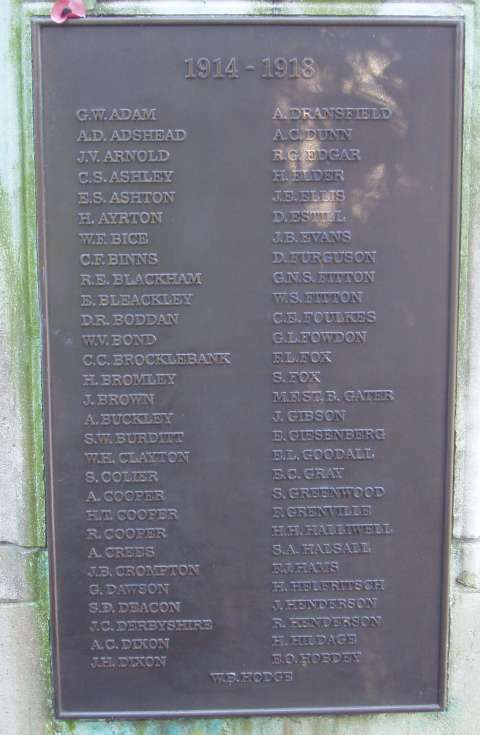 An additional plaque on the back of the plinth, in the same style as the replacement one, carries seven additional names from World War I, including a nurse, Gertrude Powicke, the only woman on any war memorial in Stockport. We presume these names were the result of additional research. The 1939-45 plaque on the front of the memorial is rather awkwardly shaped. Unusually, the number of casualties listed is of the same order as on the World War I list. Normally, one find far fewer World War II names on such a memorial. If you know the reason for the large number, please let us know. 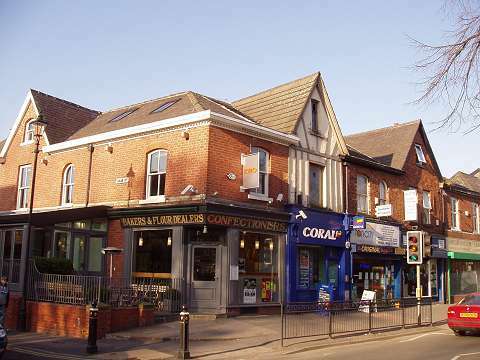 Shops in Heaton Moor Road: The 'Kro' company has restored a baker's shop to its original Victorian style as a café and bar. Written by Charlie Hulme, December 2008.